Cat allergies affect approximately 10 million Americans and are twice as common as dog allergies. There are more cats in this country, 90 million in 60 million households, than any other pet. 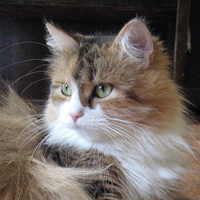 The first thing people with cat allergies want to know is: are the Siberians truly hypoallergenic? The answer to this question is yes. Siberians are hypoallergenic. The prefix "hypo" means "less than" and thus the word hypoallergenic tells the kitten/cat buyer that this breed produces fewer allergens than other cat breeds. Hypoallergenic does not mean allergen free. No cat is allergen free. The fact remains that even if a cat is hypoallergenic, they still produce the Fel d 1 protein which can cause allergic reactions. The primary cause of allergic reactions to cats is caused by allergens found in the sebaceous glands in the cat's skin and can also be found in their saliva. Contrary to popular belief, cat hair itself is not allergenic. When cats lick and groom themselves, they spread a particularly potent protein called Fel d 1 all over their fur. Then the saliva ladened with Fel d 1 dries and because it is several times lighter than air, floats throughout the cat's environment. Allergens are also found in the feces, serum, urine, dander and hair roots of the cat. Cat dander, which is comprised of the liquid secretions and shed skin cells, is very sticky and can latch on to multiple surfaces, including clothing, walls and furniture. An allergy occurs when the body over-reacts to a substance (allergen) and produces excessive amounts of histamine. Excessive histamine production leads to the irritating symptoms associated with cat allergies like itchy eyes, sneezing, congestion and skin rash. Reactions to specific pets depend on several factors, like the severity of a person's allergies, the level of allergens a pet produces, and how much the person is exposed to the pet. Whole cats produce more allergens than altered cats and adult cats produce more allergens than kittens. Early spay and/or neuter is recommended to prevent the rapid increase of the allergens as the cat approaches maturity. 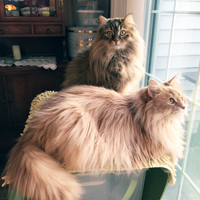 The Siberian cats have been tested and have been found to produce lower levels of Fel d 1 and, therefore, provide less allergic reactions than do any other cat breed. That is why they are said to have hypoallergenic qualities (having a decreased tendency to provoke an allergic reaction). Many people who have never been able to have a cat due to allergies will attest to the fact that they can tolerate a Siberian just fine, my husband being one of them. And generally, if someone does have an allergic reaction to a Siberian, it is far milder than they would have reacted to any other breed. I have also found with kittens that if you have a mild reaction when you get your baby home, you will build a tolerance and within a few weeks be absolutely fine. 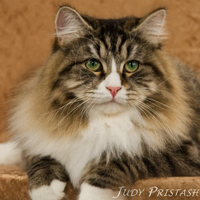 With that a being said, the only way to tell for sure if your allergies will tolerate this wonderful breed is to do an allergy test with a Siberian cat. When going to a breeder's home to do an allergy test, you should keep the same clothes on for up to 12 hours after exposure, as some people may have a delayed reaction. Some people are quick to blame allergy symptoms on their cat even if they haven't suffered previously. Doctors too find the cat a convenient scapegoat. Many people re-home or euthanize cats, only to find that they are allergic to dust mites, mold, furniture polish or dust from a new carpet. An individual rarely has a single allergy. If you are having allergy symptoms and think it may be due to your cat, have a skin test done to make sure it isn't something else you are reacting to. It is important to find an allergist who understands your commitment to living with your pet. A combination of approaches, medical control of symptoms, good housecleaning methods, and immunotherapy is most likely to succeed in allowing an allergic person to live with pets. The good news is that some allergy sufferers are successfully treated for cat-allergy by desensitizing injections. Use high-efficiency HEPA air cleaners, either central or portable. An air filtration system will reduce the amount of allergens circulated. HEPA filters are worth the investment for everybody, but especially for somebody allergic to cats. These filters will cut down the amount of cat dander in the air and should reduce the severity of your cat allergy. Regular cleaning and/or replacement is required to keep them working properly. Vacuuming your carpet daily can also help reduce the dander in the house. Vacuums with HEPA filters will help to keep the carpet and furniture dander free and help to reduce the allergens. Cat dander settles onto carpets and soft furnishings, which act as a reservoir for the allergen, releasing it back into the air when touched. I highly recommend the Dyson Pet Vacuum. You can also use a "microfilter" bag in the vacuum cleaner to effectively catch all the allergens. Carpet can accumulate up to 100 times the amount of cat allergens as hard flooring, so replacing the wall-to-wall carpet with wood, ceramic tile, laminate, vinyl or linoleum will keep allergens from accumulating as much. The less carpet in your home, the better for allergy sufferers. If ripping up the carpet is not an option, have it steam cleaned as often as needed. Also, avoid heavy drapes that trap the allergens and dust. Keep the house as clean as possible by washing floors with hot water to eliminate the allergens. The best way to so this is with a steamer cleaner, which can also be used on walls and soft furniture. Ventilate your house. Opening windows and using exhaust fans can help increase air exchange and decrease airborne allergens. Use dust sprays while dusting to minimize dust spread. Create an allergen-free room where you can go to give your body a rest from allergen exposure. 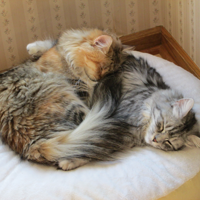 If you are fighting cat allergies, you need at least one cat-free zone in your house and since we spend much of our time sleeping, the bedroom is usually best. This will provide one location in your house that you can go to that will be dander-free. Use a high-efficiency HEPA air cleaner (available at almost any home and garden store or discount department store) in the bedroom. Consider using impermeable covers for the mattress and pillows because allergen particles brought into the room on clothes and other objects can accumulate in them. When you build up a tolerance and your allergies subside, you can let kitty back into your bedroom again. Do what you can to reduce your other allergies. Very few people are allergic only to cats. Also, wash your hands after handling your cat and refrain from touching your face or eyes. Keep the cat litter box in a well-ventilated area and dip, rather than pour it out when you empty the box. Make sure to use a litter box with a cover. There are allergens in cat urine, so scooping the box daily and keeping the allergens out of the air as well as you can is essential. The litter you choose is also important. You should use a non-clay litter since the clay dust is bad for the cat and for humans. Try to find a litter that is as dust free as possible. If the person with cat allergies is scooping the box, I highly suggest that they wear a mask while doing so. Wipe the dander away. Bathing a cat often is suggested as a way to reduce the dander, but experts disagree on its effectiveness as the cat would have to be washed almost daily. Instead, daily use of products such as Allerpet Wipes will remove saliva and dander from your cat's hair and are less stressful for felines who prefer not to be bathed, which is the majority of them! Studies have shown that it was effective for around 80% of its users. Before applying, use a fine-toothed comb to rid the cat of loose hair. Then moisten a wash rag with Allerpet and apply it first against the lay of the hair, then as close as possible to the skin as you can get it. Use once weekly for best results. 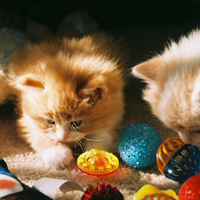 Washing your cat’s toys and bedding also reduces the number of allergens floating around your home. Do this at least once a week. Nasonex. In people who have nasal allergies, the immune system reacts to an airborne (inhaled) allergen by creating an antibody called immunoglobulin E, or IgE, that is designed to fight that specific allergen. This antibody-allergen complex attaches to certain cells in the nasal passages and causes the release of chemicals including histamine, which in turn cause inflammation. The end result is nasal allergy symptoms—congestion, sneezing, itchy nose or runny nose. Use Nasonex. For adults and children aged 2 years and older, once-daily NASONEX is clinically proven to help relieve both seasonal (outdoor) and year-round (indoor) nasal allergy symptoms including congestion, sneezing, itchy nose or runny nose. It is important that you take NASONEX regularly as recommended by your doctor, since its effectiveness depends on regular use. Maximum treatment benefit is usually achieved in 1 to 2 weeks. Benadryl. Benadryl is an over-the-counter allergy medication that can provide relief for cat allergies in some people. Benadryl products are available in several forms in strengths appropriate to both children and adults. The medicine in Benadryl is diphenhydramine. Claritin. Claritin is also an over-the-counter medication for allergies. The antihistamine used in Claritin is loratadine. Claritin was approved by the U.S. Food and Drug Administration (FDA) in 1993 as a prescription allergy medication. In 2002, the FDA approved over-the-counter sales of Claritin and loratadine products. Zyrtec. Zyrtec is another over-the-counter antihistamine. 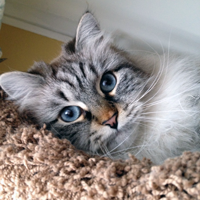 Cetirizine, the active ingredient in Zyrtec, can help relieve cat allergy symptoms. Zyrtec is available in a number of formulas, including medicines appropriate for adults and children. If you are susceptible to side effects from antihistamines, another class of allergy medication, called corticosteroids, is available by prescription only. In addition, your doctor can prescribe other forms of antihistamines that may not trigger side effects. Some prescription allergy medication is taken daily in pill form. For people with severe cat allergies, a periodic allergy shot can be very effective. There is no cure for allergy to cats, but immunotherapy (allergy shots) may help increase your tolerance. They work by gradually desensitizing a person's immune system to the pet allergens. Allergy-causing proteins are injected under the person's skin, triggering the body to produce antibodies (protective proteins) which block the pet allergen from causing a reaction. Patients are usually given one dose per week for a few weeks to months (depending on the severity of the allergy) and then can often manage with one injection per month. Here are a few herbal remedies that can help fight your cat allergy. These can all be found at your local health food or organic store. Eucalyptus is one of those natural wonder-drugs. In this case, it is an excellent natural allergy tonic. It soothes coughs and alleviates nasal congestion. It can also be used as an antiseptic on cat scratches. The best known herbal remedy is stinging nettles, available in capsule form. Other herbs work well in treating coughs, runny noses, itchy eyes and preventing congestion: alfalfa, licorice root, red clover, apple cider vinegar, cayenne, lobelia, fenugreek, eyebright, horehound, and dried mullein leaf. Take 500 milligrams, or one to two capsules every four hours when symptoms are prevalent. Aloe vera, witch hazel, fish oil, flax seed and evening primrose oil have all been used for relief itching from allergies. Consult a natural market or pharmacy for recommendations on herbal blends that could help with cat allergies more than a single herb. Many nutritional supplements can help boost your body’s natural immunity to cat dander. These can also be purchased at health food or organic stores. To start, a basic multi-vitamin with minerals might be enough to reduce allergy symptoms. Pick one that is sufficient in Vitamin A, selenium and zinc which all boost the immune system naturally. Take one multi-vitamin a day. 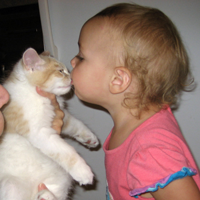 Vitamin B5 helps produce adrenal hormones, which can reduce allergic reactions to cat dander. Take 500 milligrams at least three times a day. Vitamin C can be used as an antihistamine and also to help relieve itching. High doses should be taken throughout the day. Try to take at least 6,000 milligrams, but not all in pill form. Use fruits and juices to get as much in your system as possible. Vitamin E produces antibodies and can be taken daily to help combat cat allergy symptoms. Pine Bark Extract can act as an antihistamine against cat allergy symptoms. Take 300 milligrams a day. Curcumin is similar to prescription strength cortisone without the risks of high blood pressure and heart disease. It can be taken up to three times a day in 500 milligram dosages. Bromelain can help reduce any inflammation throughout the body caused by the allergy. Take up to 1,500 milligrams a day. L-Histadine is an amino acid that blocks the production of histamine in your body. It can be taken up to three times a day in 500 to 1,000 milligram dosages. Bromelain and Quercetin are also known for having natural antihistamine properties and are a great supplement for allergies. Take it with vitamin C as they work in tandem. Alternative cat-allergy remedies include energy-based allergy elimination, holistic care, acupuncture, herbology, yoga poses and naturopathy. As more people adopt a natural lifestyle, these nontraditional treatments are becoming more common. Disclaimer: These are suggestions for allergies and as everyone has unique health histories and concerns, it is essential that you use this as a guideline and not as advice directly for you for this condition. Please consult with your health care physician before starting any of these treatments. © 2018 Heavnzsent Cattery, LLC. All text and photographs are copyrighted and may not be copied or reproduced. All rights reserved.